There seems to be a general assumption that somehow these two terms are the same. But using a “Green” product may have nothing to do whatsoever with sustainability. Green products might suggest using products with low volatile organic compounds like sub-floor adhesives, urea formaldehyde or using a material that takes less fossil fuel to produce or to deliver to your project but it doesn’t necessarily take in consideration long range future energy costs of running your home. Using solar heat and PV systems can reduce your current reliance of fossil fuel but how do those system help your energy need 50 years from now when the warranty of today’s solar systems are only good for an average of 10 years from the time of purchase. PV panels start loosing their efficiency as soon as you start using them, we mention this because this is a consideration when calculating the percentages of sustainability. We are fans of solar and making the correct selections are extremely important in your sustainability scheme. Sustainability practices bear considerations of environmental fragility, future situational and environmental effects on efficiency with the long term in mind. Understanding what the future holds is something no one can determine with certainty but paying attention and giving credence to today's science will afford you the ability to make more of an educated decision regarding what we should expect. We can clearly see adjustments happening to our global climates. Locally, in the past three years we have recognized right here in Colorado how our seasons appear altered, our spring starts at least a month early and our fall lasts approximately a month and a half longer shortening our winters overall. As builders we pay attention to these things because our business is directly effected by inclement weather. In both the NASA and NOAA records, January and February were both record warm temps, with February beating January as the most anomalously warm month ever recorded, going back 135 years. Some may equate this solely to the elevated El Niño effect but then science would explain the elevated El Niño effect was caused by warmer ocean temperatures. If you are still uncertain of the science here are a couple titles you should consider. These titles are available on Netflix if your curious. What quantity or level of environmental externalities are you are willing to bestow to future generations as a result of your choices? There are many considerations that make up green building projects and we offer choices that can accommodate any style and any intensity you desire in building your home. We highly recommend you focus on sustainability in conjunction with green building aspects; Whose programs or portions thereof are you considering? LEEDS (leadership in Energy and Environmental Design), Green Building Council, National Green Building, BREEAM (Building Research Establishment Environmental Assessment Methodology) or a custom developed sustainability program? We have flexibility to take on any of these programs or individual portions of these programs that fit your model making your home as green and sustainable as you need it to be. Its important to realize that sustainable building practices cost more upfront than traditional building but it is an investment that will pay throughout the existence of your structure. We have experience with the alternative energy industries and we have a mind for sustainability along with the interest to always explore new options. We are always looking to implement sustainable aspects, like double exterior walls, geothermal heating systems, green roof systems, and for the most part any technology that will help to reduce our environmental impact and make your home, as comfortable and self-sufficient as possible, always looking toward the future. We strive as builders to reduce our footprint we produce during our operations consolidating our deliveries, reducing our construction waste by recycling when available and re-purposing items when possible. Considerations should be given for the summer and winter exposures. The properly placed home will minimize the need for cooling in the summer and heating in the winter. The design of your home should consider the trees on your property, the overhang of your roof or eaves, skylights, and passive solar and any other terrestrial masses that can block your solar gain, conversely creating heat islands need to be considered as well. If your plans are not specifically designed for the lot these considerations should still be heavily weighed, it is very possible to alter features optimizing the home for your building site. Considerations for surface water run-off are typically not considered above the bare necessity to mitigate any potential damage that might be caused by changes in the grade as a result of the construction process. When starting the building process the installation of silt and sediment controls guard against the loss of disturbed materials from excavation activities and protect neighboring properties from receiving unwanted collateral damage and unwanted material invasion. These measures should be common place today but considerations and planning for surface water control post construction is not a common practice with most average architects. We all recognize more extreme storms and periods of drought are cause for concern with regard to surface water or the lack thereof. Extreme storms cause flooding, erosion and potential damage to your structure - provisioning for these situations should be a primary concern when designing your project. Protecting your homes foundation by directing excessive water saturation is imperative, traditional style french drains have proven failures resulting from the build up of silt and improper bedding. Today's more advanced drain systems provide greatly improved consistency and longevity, costing a little more but ultimately much less expensive that dealing with compromised foundations, and the consequences of flooding such as damage to your homes finishes, belongings and mold. The effects resulting from large quantities of rain, hail or snow need to be mitigated before they occur and many mitigation efforts do not need to be expensive. When designing for your property the primary baseline should start with a professionally prepared soils analysis and local historical average climate condition, from there considerations for extreme conditions are introduced. Future extreme conditions are legitimately unproven though we are currently experiencing relatively wide variations many consider atypical. The level of design should be a measure of your general understanding for the future weather potentials along with your architects professional awareness of today's climatological science, futurecasting climatic conditions and available mitigation efforts. Planting appropriate trees and ground covers will absorb excessive precipitation and work to slow down the flow of water gravitation allowing for your soil to retain more and shed less. The method of slowing down water flow with the intent of allowing the soil to absorb the moisture is not a good idea in every soil condition. Areas comprised of clay or soils that include clay allowed to absorb high levels of moisture cause expansion and can create damage. Its very important to have a professional work with you when planning your surface water control design, the average landscaping contractor is not qualified and does not carry the appropriate liability insurances, always use a licensed landscape architect. Hiring a professional landscape architect is well worth the investment. Striving for energy efficiency is key for the future and building a net zero home is currently our ultimate aim. We are trying very hard to implement alternative energy sources within each home. If you are not a fan of alternative energy or not quite ready to take the leap consider your current energy usages. You may take into account some of the concepts alternative powered homes use without going completely alternative. Everyone knows that a cell phone charger will use energy when not charging your phone. Everyone has a cell phone, or iPod, or laptop and each of these devices must be charged typically on a daily basis. Now multiply these devices by the number of people in your home and how much energy it takes to service all portable devices. Look into incorporating a charging station centrally located in your home where all of these items will be when in the charging mode. The power supply can be on a timer for example all devices can be charged typically between the hours of 12 midnight and say 4:00am. Outside of scheduled charging time you can manually turn on the power to charge when your device runs low and you will be needing to use it in the near future. When considering large appliances, such as in your kitchen, or utility room, look for high efficiency Energy Star appliances. Analyze the energy consumption of your entire home. Consider options to reduce the consumption of every appliance. If you spend more on a more efficient appliance, does it make sense from a financial perspective? How long will it take to pay off the difference so you can view the overall saving of your carbon footprint. Using an on demand hot water heater verses a conventional hot water heater costs more up front but it will save you considerably in the long term. Thermal Envelope is a term used to explain the transference of temperature from outside to inside and from inside to the outside. Many homes leak allowing the transference of temperature. The goal is to take the time during construction to assure the home is sealed to the best of our ability in so reducing the energy exchange. Look at the connections between the foundation and your walls, consider the corners and any penetrations between floors, and exterior/interior. Adding to the mix is solar heat gain. While in cold climates during winter months solar heat gain can be a major plus, in contrast in hot climates during summer months the solar heat gain can be counter productive to energy conservation. Solar heat gain can be reduced by incorporating selections such as lighter colored roofing materials, triple pane or low E / gas filled thermal-pane windows, radiant barriers, using various types of insulation. Look to implement convective cooling through cross ventilation. Don't overlook the positive aspects of solar heat gain even in warmer climates. Consider the benefit of solar heat gain in your design. Passive solar radiation can help you stay warm in the winter regardless of your geographical location. The degree of passive solar is completely up to you and can be incorporated in your home with seasonal aspects. In the summer your eaves are large enough to block the sun from directly affecting your thermal mass, while with the suns winter attitude your thermal mass is keeping you warm radiating the natural heat energy. 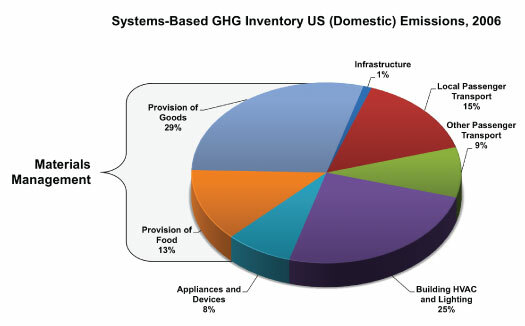 Household Emissions accounts for approximately 33% on average of your total (GHG) output. This energy mostly comes from fossil fuels, the largest global source of heat-trapping greenhouse gas. Doing your part to reduce your output is the most important thing an individual can do short of establishing a revolution. Below is the most recent published chart by the EPA as of the date this information was originally published. Tapping into the geothermal aspects of heating and cooling is a great way to reduce the quantity of fossil fuel. Installing a solar thermal heating system and the Solar PV system will also reduce your fossil fuel consumption. To HRV or ERV is a question most people battle with and common belief is that it depends on climate, that HRV's can't be used in summer and ERV's can't be used in winter or the core will freeze up. Both of these issues concepts are false, today ERV systems have a stand-alone dehumidifier and the HRV system runs in conjunction with your Air conditioning unit, any heat produce by the HRV is mitigated by the Air system. In cold climates the majority initially believe HRV's would be better than the ERV's but it really depends on a few factors. Humidity of your home plays a role in the result of your system, today's home are much better insulated and air tight than in the past. The average humidity or projected average humidity in your home during winter and summer months will determine the rate of ventilation. CERV - "Conditioning Energy Recovery Ventilator" - Highly Efficient at keeping your home healthy and comfortable at the same time. We have heard the comment - "Just open a window what do you need that for"? Opening windows is not a good option in the dead of winter or in the heat of the summer. If you have allergies opening a window won't help reduce the quantity of pollen entering your home but these ventilation systems will freshen the air in your home on a continuous cycle creating a healthier environment. We build homes as tight as today's technology allows leaving no room for leaks as is historically the case. Older homes and homes presently constructed today using conventional methodologies leak, some more than others but our sustainability concepts don't. We build as energy efficient as our architects and high-preformance minded clients allow; When we see a tight design we always recommend one of the three systems we've mentioned above if not included in the plans. Our team of contractors includes specialized professionals that design ventilation systems respective of your individual custom home plan utilizing "ZERO's" (Zero Energy Residence Optimization Software). Zero's considering construction materials, insulation values, heat loss and gains, volume of your structure, number of levels that make up your structure and their projected usages and percentage of finished living space, alternative energy systems, the number of occupants and occupant provided typical activities.